“Dracula”, directed by Tod Browning and released in 1931, is probably one of the most famous horror films of all time, and the first of the Universal Horror films of the Golden Age. It is the first sound horror film, and an immensely important film in the genre and stars Bela Lugosi in the titular role. The movie is based off of the book of the same name by Bram Stoker (Abraham Stoker) which was released 34 years earlier, in May of 1897. The story, and later horror classic, essentially established the myth of the vampire in popular culture for the rest of time. 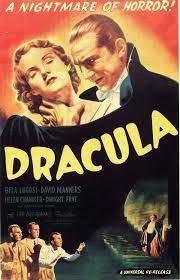 Now there were stories about vampires before 1897, and Dracula wasn’t even the first film based on the book itself. There was Nosferatu in the 1922 a silent film directed by F. W. Murnau. Although probably the most famous silent film of all time, Nosferatu was actually an unauthorized adaptation, and so the names of the characters (most notably the Count himself) were changed, changing Dracula to Orlock. When I went to film school, the print we watched was one that hadn’t had the name reversed back to Dracula as some modern prints of the movie do. Now two things I would like to make mention about Dracula, is that the plot only loosely follows that of the book with more than a few deviations, and that there was also a Spanish version of this film made at the same time as the English version. It used the same sets and was filmed at night when the English actors ad crew had left, and also utilized a completely different cast. There are some differences between the films and some people even prefer the Spanish version of Dracula over the English one. Okay, enough history, lets get to the review. Right off the bat this movie hits with a very good title sequence. Technically speaking it’t nothing to write home about, but it;s the music in the background that makes it great. The theme song playing is “Swan Lake” by Tchaikovsky . The song was also used in the 2010 film “Black Swan” with Natalie Portman and Mila Kunis. Just at the title “Dracula” comes into frame, we are greeted by the beginning’s of this song, and and the opening credits continue the song picks up becoming more grandiose and epic, until they finally dull down and we fade into our opening sequence. An interesting note is that the opening theme is the only bit of music in the entire film. The rest, even though this is the first sound Horror movie, contains nothing but the static sounds of the reel and the spoken word of our actors. This scene encapsulates something that we’ve seen in film about 1000 times. Something that now is a cliche, the villagers. They are superstitious and warn about “Nosferatu” and the evils of Castle Dracula. We are introduced to Dwight Renfield, played here by Dwight Frye. Now Dwight Frye isn’t as famous for his roles in the Universal Films as Bela Lugosi and Boris Karloff (real names Bela Forenc Dezsco Blasko and William Henry Pratt) but he was featured in multiple films of the company, being seen here in Dracula, and also in Frankenstein (1931) as Fritz the hunchbacked assistant to Doctor Frankenstein himself (Colin Clive in that adaptation), The Invisible Man (also 1931) in a minor role as a reporter, and Bride of Frankenstein (1935) as Karl a henchman to Dr. Pretorius (Ernest Thesiger), the rival to Dr. Frankenstein. Although appearing in these other Horror classics, his role in Dracula was his signature one and easily his most famous. Anyway, back to the freaked out villagers. There is a particular dialogue between Dwight and one of the mountain people (as he refers to his townsfolk) that succeeds in being funny and does something I love, in breaking the normal pace of delivered lines. You see a lot times in older films, the lines are kind of whack-a-moled back and forth between performers. There’s a sense of one person just waiting for his turn to speak. This movie has that too, but it also has moments where the dialogue doesn’t feel like that and feels more like how someone talks in real life. And I like that. It happens again a little later in the film in a scene between Dracula and Renfield. Now, Frye is warned about the evils of the night and although his carriage driver doesn’t want to take him out after dark, Renfield insists and ventures off in search of his rendezvous with The Count. Now immediately we are introduced to Dracula (who reveals his name a bit later) and we essentially find out that all the fear that the townspeople had talked about before is with good reason. Dracula rises from his coffin, as well as his brides, and we get a close up of Lugosi’s hypnotic gaze. It is a look that defines the Dracula character, at least for me. Although modern takes on the vampire tale have given us different interpretations (like 30 Days of Night for example) I must state that Bela Lugosi’s portrayal is almost perfect in my eyes. Dracula comes across as very intelligent and calculating, having a certain seductiveness about him. And yet he still retains an ominous presence. His look in the film is hardly accurate to the book, but it is this version that established the popular design of the undead man monster for the rest of time. Bela Lugosi was Hungarian born and spoke very little English, really only learning the language for the roles he would play on screen. So his strange accent that he has in the movie is indeed his own, although that can hardly be said for the delivery of his lines. Dracula speaks much like that look I described before. Hypnotically. His inflections and mannerisms are very peculiar and add a sense of unease to situations. Now it has to be said that today’s average movie goer will probably not see that far into his performance, and will more than likely just view it as hokey and quite silly. But that is just the difference in the times as well as the difference in the Horror genre these days compared to then. Something else that should be noted in this film are the sets. The movie has very good sets that are both spooky and really help set a tone for the story. Now like all of the films I review, I will not be just doing a rundown of the plot scene by scene as I watch it, but instead trying to make mention of the things I feel should be pointed out and talked about. So I will not continue and tell the fate of Renfield, but I will say that he and Dracula end up boarding a ship that takes them to England, and the crew of that ship are found mysteriously dead when it arrives. Dwight Frye’s most famous role, as I mentioned before, is the one he played in this film and it shows why. Again, I will not spoil anything, but his performance here is very well done and really makes you believe that he is the way he is portraying his character to be. It reminds me of wrestling legend Terry Funk, and how he was able to make fans all over the world by into his gimmick in a way that very few in the wrestling business could ever dream of. But enough of that, were here to talk about movies and Dracula not Terry Funk and wrestling. Something else I find very interesting about this movie is the subtly. There are a lot of small and…well subtle things in this feature. A scene where a person is drugged didn’t register with me until I watched it a third time. At first, I just kinda thought they passed out, but upon re-watching I was able to see what was really happening. And it was indeed, foul play. There’s also the relationship between Dracula and his brides. Now I really don’t feel like I’m spoiling anything in telling you that his brides do make an appearance in the film, because they are so common place in films about Dracula now. But in this movie even though they interact, they don’t speak any lines to one another. It;s all done in body language, gestures and Lugosi’s cold, haunting stare. And with just that, you know exactly who’s the one wearing the pants in that relationship. An interesting addition to the story of the book itself, is that of the character Van Helsing. What makes this interesting is that the characters full name is Abraham Van Helsing. Abraham is also the name of the writer of the novel, Abraham Stoker, Abraham of course shortened to Bram. This to me seems like Bram Stoker may have identified with the character of Van Helsing especially. This is fairly common with writers really, I an even attest to such things. Although I should only be loosely considered a writer. Unless being a starving artist counts because that’s me. Anyway, Van Helsing makes an appearance in Dracula and is played by Edward Van Sloan. Edward Van Sloan is another actor that made multiple appearances in Universal Horror films, also being in Frankenstein (1931) as Dr. Waldman and The Mummy (1932) as Dr. Muller. Another credit worth noting is his role in Dracula’s Daughter (1936). Dracula’s Daughter was a sequel to Dracula, with Edward Van Sloan reprising his role as Abraham Van Helsing. Van Helsing, known in pop culture today as probably the famous fictional vampire hunter (like you didn’t now what he was doing in this film. Come on.) has been portrayed on the big screen multiple times by many famous actors. By Peter Cushing (who also played Dr. Frankenstein) in the British Hammer Horror films that remade the classics in glorious color, Anthony Hopkins in 1992’s Bram Stoker’s Dracula directed by Francis Ford Copula, and Hugh Jackman in Van Helsing (2004), an action adventure film that payed homage and tribute to the Universal Horror and Monster Films. I find it really cool that even though we have multiple characters in this movie, it’s played off in a way as such that makes it feel as though Dracula is the main character, and in a weird way the protagonist. Of course he is really the antagonist, but we are introduced to him so early in the film and follow him so much and for so long that he’s really the one we invest most into. The other characters are, to be honest and with the exception of Renfield, kind of bland. We really don’t learn that much about them and they’re about as deep in the character development department as a piece of cardboard. They don’t have the same presence as Dracula, aren’t as interesting as Van Helsing, nor do they captivate the viewer like Renfield does when he’s on screen. No unfortunately they just come across as place holders. Time wasters until someone more interesting shows up. They’re not incredibly relatable, and suffer from the same boring you speak I speak whack-a-mole dialogue that I hate. Another gripe about the characters is the complete lack in continuity between the book and the movie on who is even present and who isn’t as well as the one’s who are and fill completely different roles entirely. As to not confuse, as I feel I might already have done, I will say that even though the movie is only loosely based off of the book (as I mentioned earlier) the self contained storylines work perfectly when with the characters doing what they do and filling the roles they fill. They take the places they do just fine. What’s disappointing are the characters that played such a big role in the book like Jonathon Harker, who are downplayed quite a lot in the film. Even Mina Harker, Jonathon’s fiance and Dracula’s love interest, has a role that isn’t as big as it was in the book. She is significant in both tellings of the tale, just lesser so in here. And like I said, there are also those characters that don’t appear at all, like Quincy Morris. A lot of people who didn’t read the novel might not know who Quincy Morris is, but he’s actually a fairly important character, especially in the end of the story. So, yeah. That’s a bit disappointing. I would have liked to see him here, but like I said before, Dracula still holds up its plot fairly well without them. Really the weakest point to this film, for me, is the ending. Again, no spoilers here but the film doesn’t really have one. It just kind of, stops. Like right in it’s tracks. We don’t actually get to SEE what happens to The Count, and there’s just a rushed finish to things. Also the version I watched didn’t have any credits at the end, it just faded to black. But that’s okay because there’s pretty much all of the ones you need right in the beginning. So really those are my two major gripes with this film, the poor not-really-an-ending ending, and the lackluster, unrelatable characters. Other than that there is a lot to love about this movie and more than a few neat things that are worth checking out. Bela Lugosi’s Dracula is just great, and you really wish you saw more of him. He is in a good amount of the film though, and with a run time of only about an hour and 15 minutes, that’s a good thing. Still though, it kind of makes you wish that it was really tailored to be about him rather than making us spend as much time with the shallow characters as we have to. And of course there’s Renfield who is easily a highlight to the film. He really helps things move along and you’re genuinely happy to see him on screen when he is. Fitting since he’s the first person we really spend any time with in this movie. And last but not least, there’s Van Helsing, who even though we don’t meet until later in the film, he is still enjoyable and a very welcome edition to the cast of players. With a very interesting trio, wonderful set design, and a grand entrance, it’s pretty easy to see why Dracula is one of the legends of the Horror genre. The film was so innovative for it’s time that its kind of sad that we’ll never be able to recreate the impression it would have had on us as viewers in 1931. Film making and viewing has changed so much in the 80+ years since this films release. Yet there are a lot of things in this feature that are classic horror standards and even cliche’s nowadays. Dracula is the movie that made a star out of Bela Lugosi, and it’s his most iconic role. He was even buried in the cape as rumor has it. After this movie he was offered the role as “The Monster” in Universal’s next Horror project Frankenstein, but turned it down citing that all of the make up would ruin his performance. Interestingly enough, that role would of course make a star out of Boris Karloff, and started a Horror film rivalry of sorts between the two actors. Eventually Bela Lugosi would indeed end up in some Frankenstein films, playing Ygor in Son of Frankenstein (1939) and Ghost of Frankenstein (1942) and even the Monster itself in Frankenstein Meets The Wolfman (1943). There is no doubt that this movie and Bela’s interpretation of Dracula have become complete cultural icons, and a mainstay in pop culture as a whole. I highly recommend this film to Horror fans and film buffs alike, or anyone who like to take a peep at a standout in film history. This film is really good, but it IS dated and that may take some people out of the experience, but I definitely think you should try and look past that and enjoy what Dracula does bring to the table.